From the street at least, the Tankerville renovation work seemed to have advanced very little from last week. 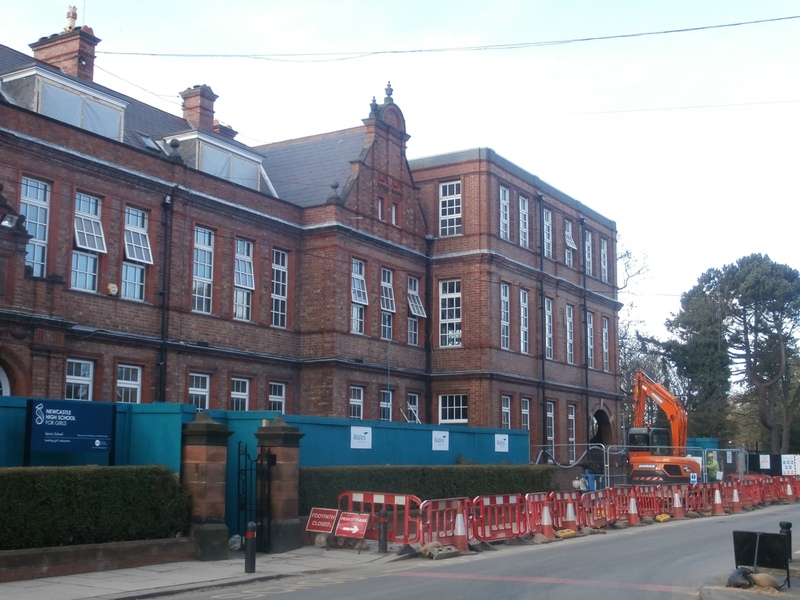 The pathway in front of the old building remained blocked by colourful red & white road works, the orange digging machine was still in situ and the windows, as usual, variously open, closed, missing or covered by sack-cloth. 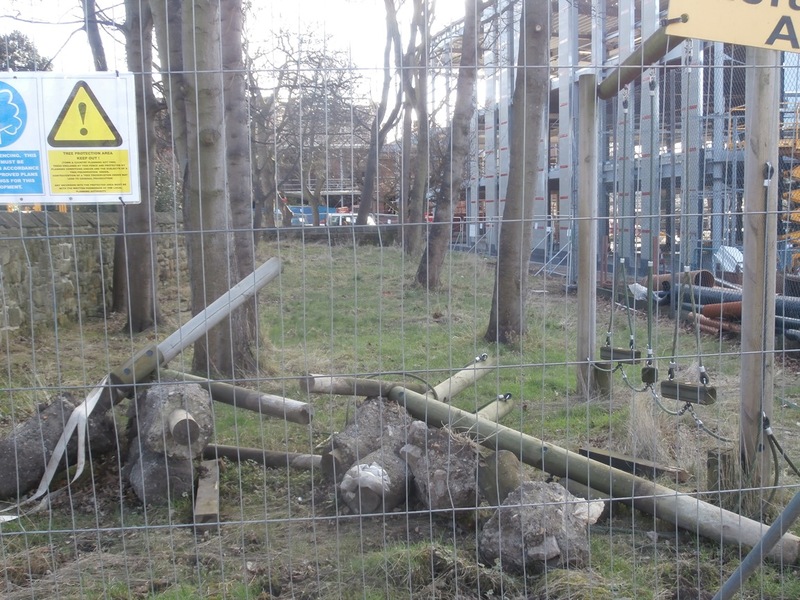 However to the left of the building, where the staff car-park used to be, hollow, clanking sounds indicated that scaffolding was being erected yet again. What for this time? The roof was my guess. And I was right. 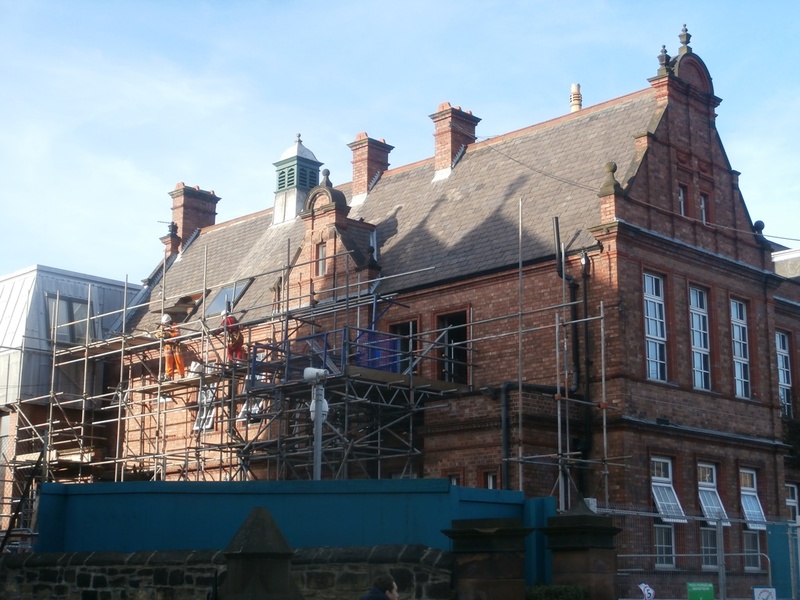 Ten weeks of roofing work was just about to commence. New scaffolding is now being erected in the old staff car-park. 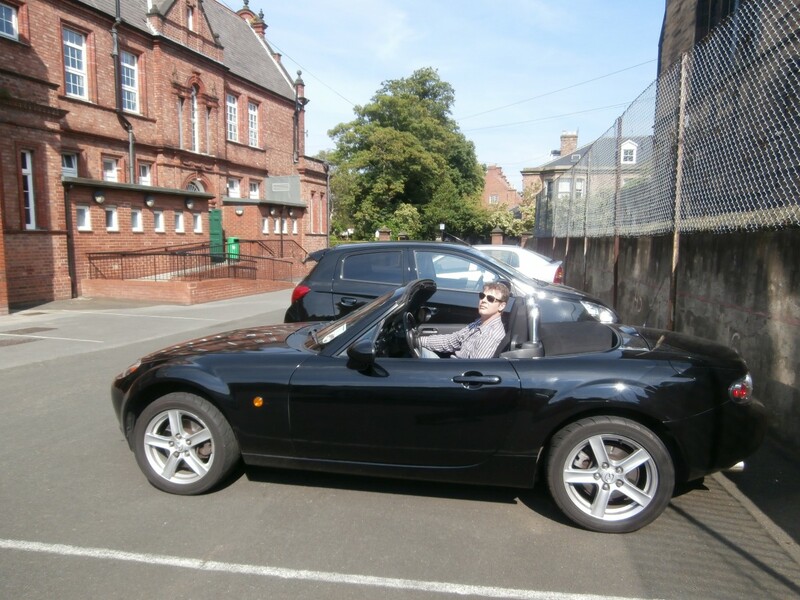 The staff car-park on a summer’s day, as I like to remember it: Steven Farrell, IT Manager, waiting to give me a lift home. 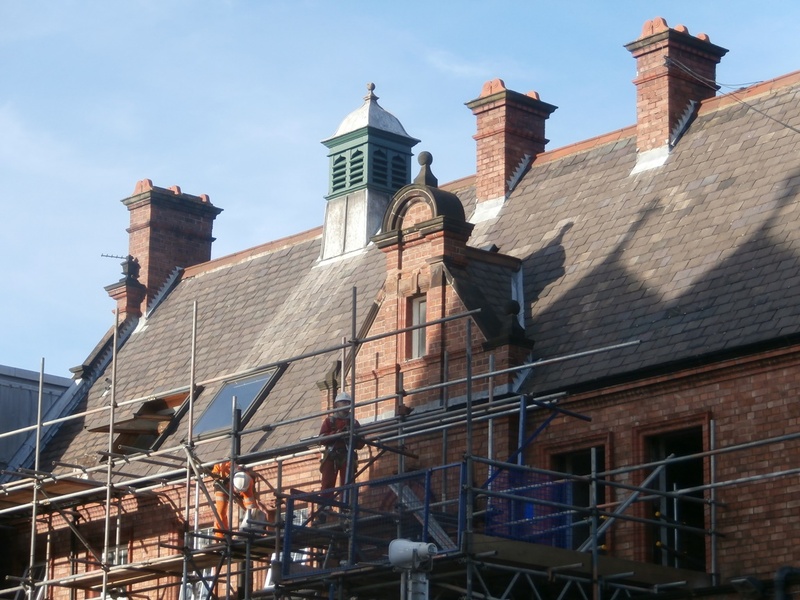 The roofline of this section of the building is very special because it retains its original bell tower feature. 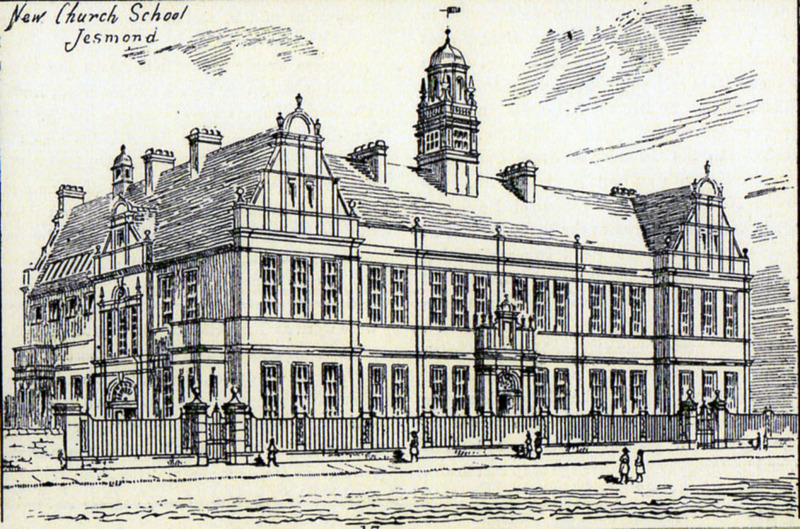 The earliest image of the High School building in ‘The Monthly Chronicle’ suggests that the main bell tower, now demolished, was of a similar design to this ‘mini’ one. The distinctive ‘mini’ bell tower shimmers in today’s sunlight. 1890 etching of the High School with both bell towers intact. 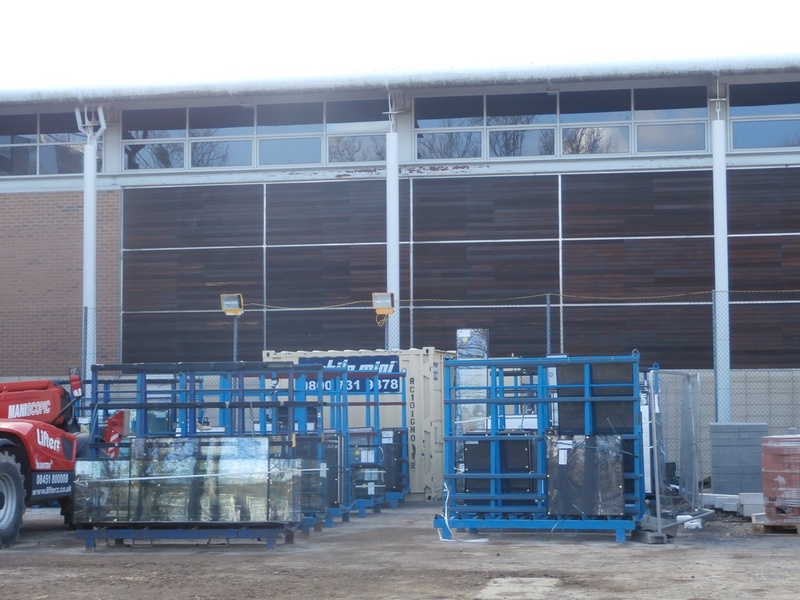 However, once I reached the new-build gates and was lead round to the Sports Hall side, it was clear that windows, not roofs, were to be the main talking point of the day. For the first time there was glass! 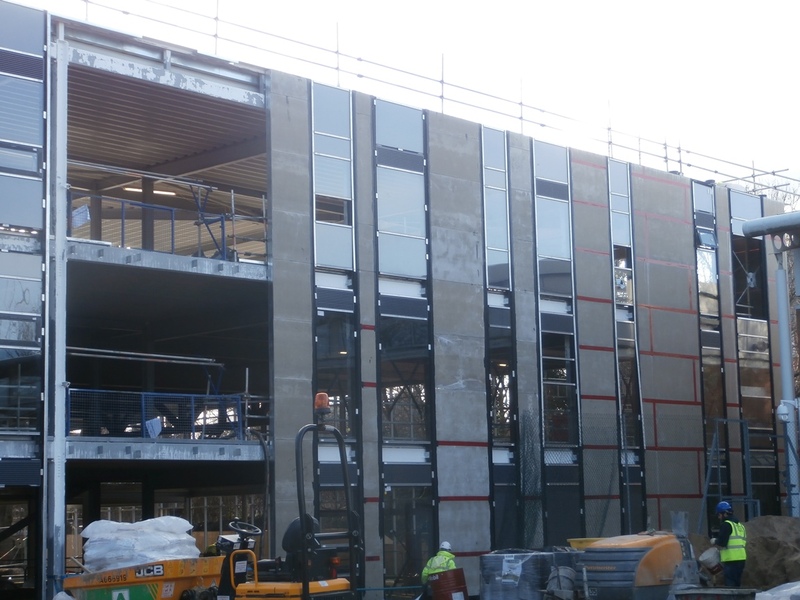 Glass now being installed in the new-build by the Sports Hall. The source of the word window is actually a metaphor. It comes to us from the Scandinavian invaders and settlers in the early Middle Ages. Although there is no record of the exact word they gave us, it was related to Old Norse vindauga (window), a compound word made up of vindr (wind) and auga (eye) reflecting the fact that at one time windows contained no glass. The metaphor ‘wind eye’ is a kenning, a poetic form beloved by both Norse and Old English poets. And close up, these particular new ‘wind eyes’ seemed very dark to me. All became clearer later on when I learned it was tinted glass. ‘Through a glass darkly’: the new tinted windows up close. At times in life, often by no choice of our own, we are forced to view things ‘through a glass darkly’, a metaphorical phrase which entered the language via the Bible (Corinthians 13: 12-13) inferring imperfect perception or understanding things ‘only in part’. It demands a huge leap of faith to trust in something we cannot yet see or to believe that new growth could possibly emerge after the end of things. We can only know what we see and feel in the here and now. Or was it not ‘Something’ but Someone? This morning I watched a fascinating documentary by Kate Bottely on BBC1 called ‘In the Footsteps of Judas‘. At its end, it too focused on windows and things initially obscured by dark glass. Laurence Whistler’s ‘Forgiveness Window’ in Moreton Church, Dorset, part of which depicts Judas’ 30 pieces of silver falling to ground where they become flowers , was intensely moving. 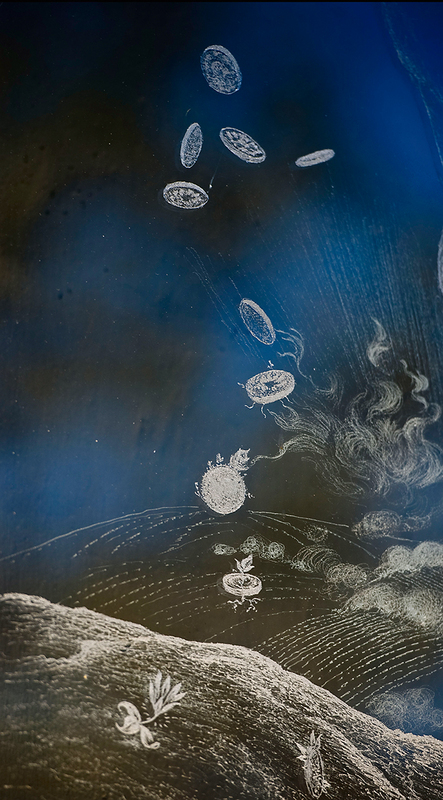 As was the fact that this image engraved on the window’s dark glass can only be seen from outside of the church. The Forgiveness Window: Judas’ falling money converts to flowers. ‘The [green] playground … with a high wire fence all around’: (Back in the Playground Blues’, Adrian Mitchell, 1982). Thank you Christine for this update. 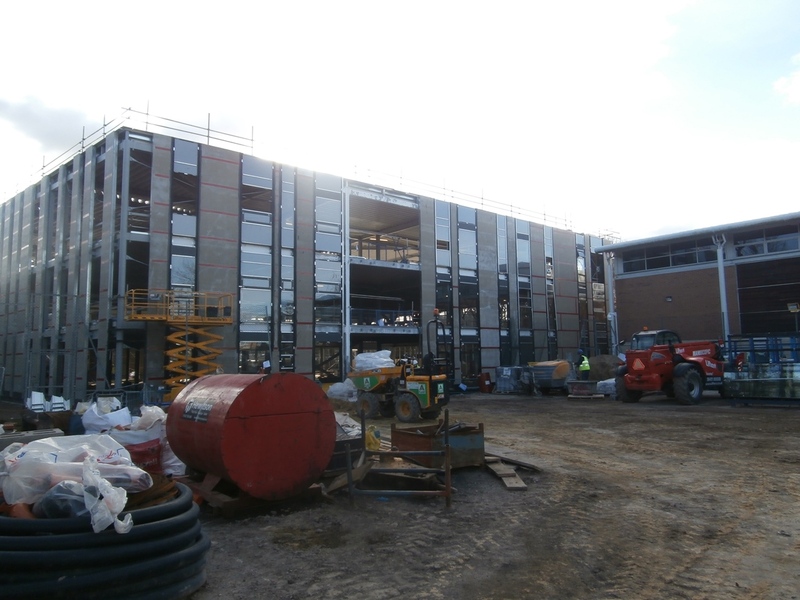 How exciting to see the progress on the new building and to see the Sports Hall once again. Happy memories of all that our girls achieved in sport.